Several Cherry Trail Atom x5 MegooPad TV sticks are on the way, but they mostly have similar specs to the previous generation Bay Trail sticks, except with a slightly faster processor, and in some models, USB 3.0 support. An Indian company is currently developing some Cherry Trail TV sticks with impressive specifications including processors such as Intel Atom x7-Z8700, up to 8GB RAM, up to 64GB storage, 802.11ac connections, HDMI 2.0, and USB 3.1 type-C connector. You can click on the processor comparison page to find out more about the three Intel processor, which are all quad core Cherry Trail processors with 2W SDP, but while x5-Z8300 is limited to 2GB RAM, x5-Z8500 and x7-Z8700 support up to 8GB RAM, feature 2 PCie lanes, and the latter also have a better GPU. The sticks will ship with Windows 10 Trial (i.e. unlicensed) and Android Lollipop by default, but the company says “all variants of Linux are supported”, and a Windows 10 License can be acquired for $49 extra. This all look great, but HDMI 2.0 and USB 3.1 are not supported by Intel processor, this product is fanless (while Cherry Trail MeegoPads all come with a fan), and their products description page is currently filled with (funny) superlatives such as “12 core very fast GPU”, “faster latest LPDDR3 RAM”, “very fast eMMC storage”, and they also used the “IoT” buzzword to describe how they can power on and off the stick with a smartphone app. Nevertheless, I asked them how they could implement HDMI 2.0 and USB 3.1, and their thermal design, and they answer made sense. USB 3.1 is implemented via the PCIe 2.0 interface, HDMI 2.0 is implemented using the eDP interface, and they’ve designed a “special passive cooling made of copper” to make sure the device does not overheat. Their promo video (below) lacks a proper demo of the stick, but I’ve been told a demo video is in the works. 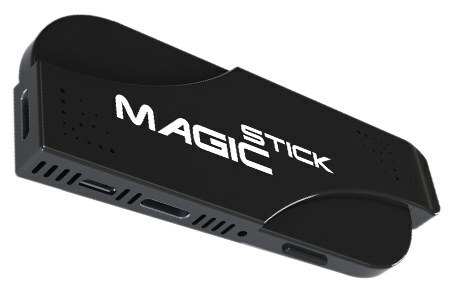 The project will be launched on September 29 on Indiegogo, with MagicStick One going for $139 ($99 early bird), MagicStick Wave for $189 ($159 early bird), and MagicStick Power for $269 ($229 early bird). I could not find out whether shipping is included in the price, but they expect to ship the rewards this December, before Christmas. Bear in mind that deadlines are seldom met in crowdfunding campaigns… If you are interested in this project, and you visit MagicStick website for more information, and/or register to receive notifications once the project goes live on Indiegogo. The “IoT” part is the one that I didn’t understand either, doesn’t make much sense if all they mean is the on/off app. The specs are good, but the project was delayed two times already, hopefully September 29th still stands. Mike, We are in the process to develop IOT based software management layer using that many different types of Apps can be programmed. Switch on and off is one very Basic App. It is possible to develop many different apps on mobile to behave MagicStick as per user interest for example ;when I come home and take tea, open particular website on TV. It will switch on TV(power),MagicStick, boot OS and run website in front of you and vibrate your phone for your glance. we are in process to give access of Bios level setting, Windows Apps settings etc in the form of IOT features can be controlled completely by phone and tablets. 29Th September is final day to come live on Indiegogo. Thank you very much for your question. Price is too good to be true! Probabably a scam or vaporware? Photos are clearly photoshopped anyway. Glad you published this 🙂 I spoke with Ambuj on Skype yesterday and I firmly believe this company means business, not just another “we’ll just repackage a reference platform and sell it for $$$” kind of setup, he has a real passion for technology and it really shows. I think their marketing material does need anglifying a little – and that video with the text-to-speech does need removing, but what they’re trying to achieve and how they’re going about it is great in my opinion. My understanding of the “IOT” side is that there is another controller separate to the CherryTrail which allows control of things like power. Another feature not mentioned (and I assume this is done by the same controller as above?) is the ability to use the device as usb mass storage! Which for fixing things like broken OS installs/etc or even just switching OSs sounds awesome! That’s a really clumsy edit to Wikipedia’s “PC-on-a-stick” page … you should really tidy it up before someone else does. Wow this looks great, I have been waiting for such a product from long time . I am glad such a product is coming to market at such a great value for money price. @ambuj @harley it looks like that some people dont knows about indiegogo they are one of the worlds best crowdfunding site , the only launch genuine products and if products are not delivered the company has to pay back money to all the backers. @Harley, we are a team of technological enthusiast, we are not put cost for our manpower devoted on it.so, It is cheaper for our community. If we put our manpower cost.It will become expensive that we don’t want to do to spoil pleasure of MagicStick !! I hope you understand my point. We have tried our level the best to bring as much possible features in possible minimum price. This comment is not related to Magicstick in particular, but crowdfunding campaigns/projects on Indiegogo are not any more reliable than those on Kickstarter, and they both have a high amount of failed tech projects. I have backed and followed a number of projects on both platforms and it seems that technology projects have a much higher rate of failure (either no product ever gets produced and backers receive nothing for their pledge or product produced doesn’t meet original specification in terms of features or quality) and are much more prone to delays than projects which have a simpler design and manufacturing process. I have lost hundreds of dollars through failed tech projects, to the point that I no longer back any crowdfunding campaign. I wait now until the product is real and out of the factory, even if it means I pay a higher price. This it’s a really good spec finally,I wish someone do it in AMD latest SOC.we need some competition. @Rafael , We have x5 as well as x7 model. 8GB RAM with Z8700 is X7 SOC and rest is X5 and rest two model is X5 SOC. This looks like a potentially exciting product but I would like to see more pictures and video of an actual reference sample..
What kind of AC adapter will be required? 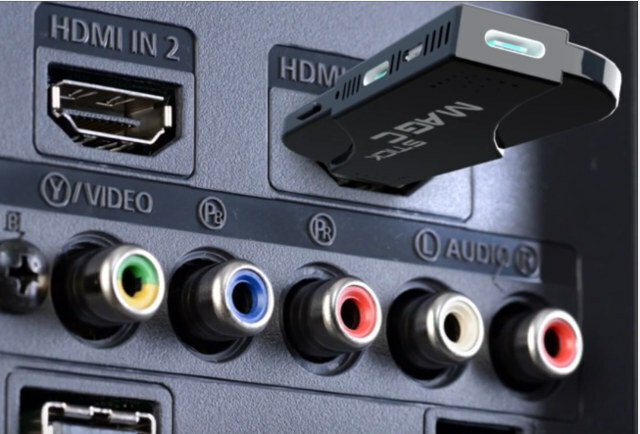 Will the device really be able to support [email protected] through the HDMI 2 port? Now that the IGG campaign has launched, it appears as though the Z8500 ‘Wave’ model has been removed and the Z8700 ‘Power’ model has been renamed into the ‘Wave’ slot. To make more easy to understand product , we have started with Two model on Indiegogo. Z8500 will be introduced later as ONE PLUS model. I pledged for wave today. It looks more attractive to me value wise. I hope it will start delivering by Dec 2015 as promised. Best of luck MagicStick team. While searching on youtube about Magicstick, i found this video. It’s working amazingly. Good work team. Keep it up.